Cici Boiler Rooms is your one-stop shop for Blue-Max® gaskets. We stock gaskets for common boilers such as Hurst, Kewanee, CB, Superior, Unilux, Precision, Columbia, Ajax, and more! 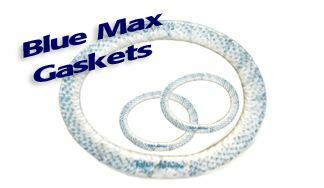 Blue-Max® gaskets give you all of the advantages of an asbestos gasket without the health risks. For maximum sealing on new and old flanges, use the max, Blue-Max®. DON’T SEE YOUR SIZE? NO PROBLEM. WE CAN GET OTHER SIZES! Zero Leakage Under Pressure. Even the slightest leakage is too much, as it increases maintenance and reduces boiler life. Tests by major boiler manufacturers confirm that Blue-Max® gaskets seal- with zero leakage-on steam to 450 psi and on cold-water hydro tests up to 1500 psi and Blue-Max® gaskets withstand working temperatures up to 500 degrees Fahrenheit. Rubber gaskets simply can’t withstand that kind of pressure and heat. Blue-Max® gaskets offer installation advantages over other types. Because of the materials construction and strength, there is no danger of over tightening the gasket and cutting it in half. A Blue-Max® gasket naturally lays flat on the flange and requires no special installation tools, procedures or training. Removal is easy and requires no scraping, chiseling or grinding. This is important in reducing the maintenance costs and down time. Rough and pitted surfaces on old or poorly maintained flanges pose no problem for a Blue-Max® gasket. The material is resilient enough to conform perfectly to surface topography and maintain the tightest possible seal. The proprietary Teflon wrap is resistant to the chemicals used in treating boiler water, so gaskets will last longer. A Blue-Max® Gasket won’t dry out or lose its strength while in sits on the shelf.